Food, clothing, housing, medical, education, etc. are the basic rights of an independent state citizen. If you want to improve a country correctly, firstly the people of the country should be provided with food security before everything else. People without safe food will lack good health and often be sick leading to less productivity therefore government must be aware of food safety and make specific laws to ensure food security. If proper safety of food is not maintained, then a country will not have healthy people. 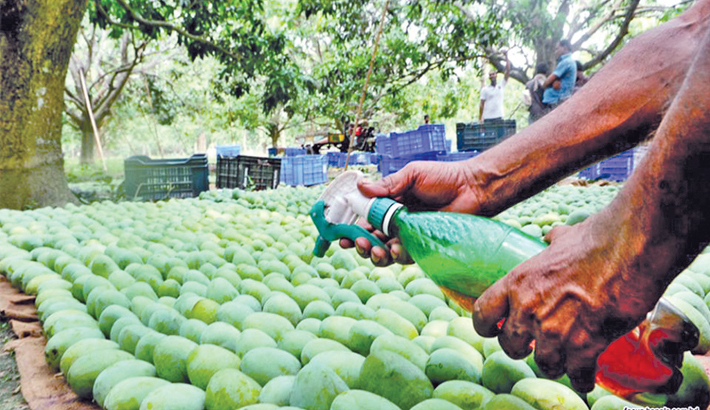 Food adulteration has become a serious problem in Bangladesh. Toxic chemicals that cause massive public health hazards are present at an alarming level in almost every food item even if they are free from adulteration. From raw vegetables, fruits, fish, meat to dairy products and processed food nothing is safe. Contamination by carbide, formalin, textile colours, heavy metal, artificial sweeteners, DDT, urea, etc. are used rampantly for this purpose. Contamination of foods with toxic chemicals poses a serious threat to public health, especially in a country like Bangladesh where level of awareness is very low due to poor health literacy. Though the country is self-contained in food, it is yet to ensure safe food for all. A common scenario regarding food contamination reveals nonconformity with sanitary practices in food handling among both producers and retailers, particularly street food vendors. But as by 2021 Bangladesh wants to become a middle income country, there is no substitute for operational manpower. So ensuring safe food must be strictly enforced by law and everyone made aware of the need for it. Speakers said this at a roundtable organized by the Bangladesh Safe Food Authority at the Daily Ittefaq on the occasion of National Safe Food Day. Bangladesh Safe Food Authority Member Professor Iqbal Rouf Mamun said, “We do not have adequate standard laboratories for testing the colours used in food.” Former Secretary Anwar Faruque said there is no special arrangement for transporting agricultural products. As a result, many products are wasted and polluted. Professor Dr Shah Monir Hossain said there are two hundred kinds of diseases, which are directly related to food intake. To ensure safe food, supervision will be done all the way from food production to the dining table. Emphasising on creating awareness among people, the president said there is no alternative to the availability of nutritious and safe food. Prime Minister Sheikh Hasina, in her message, reiterated her government’s commitment to safeguard the health of the people. She also said the theme of the day this year is time-befitting. The present government has undertaken various plans to ensure food safety and availability of nutritious and safe food, she added. According to estimates of WHO (World Health Organization), food borne and waterborne diarrheal diseases kill approximately 2.2 million people worldwide annually, a majority of them are children. But due to the lax monitoring system in Bangladesh, there is a lack of reliable data on food contamination impact on public health. ICDDR,B, an international health research organisation in Dhaka, has some data available, which shows that about 501 patients visit hospitals per day for treatment of diarrhea that is attributed to food and waterborne causes. Meanwhile, the environmental group Paribesh Bachao Andolan (PABA) disclosed horrific findings on the use of formalin, after collecting 263 samples of fruit and traditional iftar items from different parts in Dhaka. They found 100 per cent of vermicelli and citrus fruit, 95 per cent of grapes, 91 per cent of bananas and 90 per cent of noodles were contaminated with formalin and other harmful chemical preservatives, as well as 82 per cent of mangoes, 77 per cent of dates, 75 per cent of tomatoes, 60 per cent of eggplants, 59 per cent of apples and 20 per cent of cucumbers. According to the Ministry of Law there are 15 safe food delivery laws and regulations to prevent adulteration of food in Bangladesh such as: Penal Code, 1860, Control of Essential Commodities Act, 1956, Food (Special Courts) Act, 1956, Pure Food Ordinance, 1959, Cantonments Pure Food Act, 1966, Pesticide Ordinance, 1971, Special Powers Act, 1974, Fish and Fish Products (Inspection and Control), Ordinance, 1983, The Breast-Milk Substitutes (Regulation of Marketing) Ordinance, 1984, Bangladesh Standards and Testing Institution Ordinance 1985, Iodine Deficiency Disorders Prevention Act 1989, Vokta Odhikar Songrokkhon Ain, 2009 [Consumers Rights Protection Act 2009], Sthanio Sarkar (City Corporation) Ain, 2009 [Local Government (City Corporation) Act 2009], Sthanio Sarkar (Pourashabha) Ain, 2009 [Local Government (Pourashabha) Act, 2009] Mobile Court Ain, 2009 [Mobile Court Act, 2009]. Such a large number of laws for a single purpose like food safety is quite unusual and unprecedented in other countries. The main bases of food security laws should be properly enforced, to ensure food adulteration prevention and hygienic food preparation. Those who are engaged in food adulteration or unhygienic food preparation should be punished under the system. They have to face trial or legal action against them. There must be no compromise as food must be produced properly. It is necessary to ensure that food is available without any adulteration in every region of the country. Since one of the basic needs of the people of a state is food, therefore, everyone must be aware of food security. Consistent efforts by the Ministry of Food and Agriculture, all the ministries and divisions are urgently needed to ensure safe food.